One the challenges when writing villains in an adventure story is making them a threat credible enough to be a believable challenge, but not making them so competent that they can’t be ultimately defeated. (I mean, unless you’re writing a conspiracy thriller in the ‘70s.) The Pax Americana folks have to be coordinated and powerful enough to destroy most of the US government, but not so powerful as to wipe out anyone who’d stand in their way after the bombing. They needed to be good enough staying hidden that they could give our heroes the runaround for at least one season and maybe more; but not so good that they kill off the people hunting them down, or manage to kick Kirkman out of office. This is a tough needle to thread, and while most audiences are willing to cut writers a certain amount of leeway if things stay entertaining (after all, the real reason Bond villains use elaborate death traps is because elaborate death traps are fun), I feel as though Designated Survivor has struggled to keep up their end of the relationship. “Brace For Impact” picks up right where last week’s cliffhanger ending left off, with Hannah waking up in a van full of explosives parked under the FBI building. Through quick-thinking, she manages to get the bomb out of the building and saves the day. It’s not a bad opener (if you can overlook some awkward green screen), but it doesn’t really explain why the bad guys left Hannah alive so she could escape. After all, if the plan was to blow up the building, Hannah would’ve ended up a corpse either way. And if the plan wasn’t to blow up the building, then… well, what the hell was it? Patrick Lloyd ends the episode with hacked intel of the US’s entire defense structure, which sounds both impressive and a bit goofy. It certainly seems like he got what he wanted. But his cover is completely blown, he lost his mole in the White House, and Lozano is finally and absolutely dead. If they’d killed Hannah when they had the chance, it’s likely neither of Lloyd’s men would’ve been caught. I don’t mean to fixate too long on a minor point, but it’s endemic of something the show has struggled with through its entire run so far: an inability to create bad guys who register as more than just plot obstacles who are as good or as inept as the story needs them to be in that moment. That hinders suspense, but it also makes for some profoundly uninteresting enemies. Everything about Pax Americana is generic, a vaguely realized hodgepodge of fears that never developed into a danger that was plausibly credible, even as they accomplished horrifying things. “Brace For Impact” spends most of its running time focused on the conspiracy, and that’s actually not a bad choice—or at least, it wouldn’t have been a bad choice if the conspiracy wasn’t such a dud. Hannah’s frantic efforts to stop Lozano lead to a decent car chase and a brief but exciting fight (which Lozano is definitely winning right up until Hannah kicks him onto some rebar). Had the season done a better job of defining people like Lozano and Patrick Lloyd—not to mention the bizarre mistake of giving us a White House spy who was a character we had no interest or emotional connection with at all—than this could’ve been a terrific closer. As is, it’s not entirely terrible, and if you’ve made it this far with the show, I can see walking away moderately satisfied. But it’s still not particularly good. Honestly, as is I’m not sure this will ever be a “good” show overall. 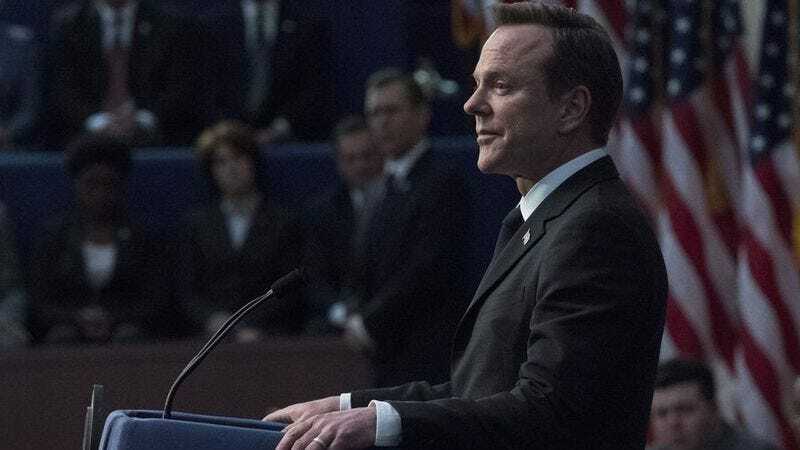 Certainly not a great one, but there’s no shame in being pleasantly watchable; Designated Survivor has its work cut out for it next season if it wants to achieve that goal. The pieces are there. Kirkman talking to Emily, Seth, and Aaron about what was really going on was a good reminder of how likable this group can be, and as corny and sentimental as his speech ending the episode was, it felt like a self-aware corniness. Because let’s be honest, unless there is major retooling, this is never going to be a particularly dark or cynical or nuanced show. It’s going to be goofy and over the top, a fundamentally idealized vision of an America where someone finally gets a chance to get things done in Washington. Maybe that’s the problem with the conspiracy right now; it simply isn’t over-the-top enough to compete with sweetly foolish golden glow of Kirkman’s White House. Patrick Lloyd needs to be cartoonishly evil, or else turn out to be an alien, or, god, anything to make him worth keeping around for another season. At its best, this is some diverting escapism, a chance to watch Kiefer Sutherland do his best Mr. Smith impression as he brings common sense to politics. At worst, it’s Parallax View by way of Fisher Price. Hopefully someone in charge manages to pull this together, or Kirkman won’t have to worry about another bomb ending his time in office. Hannah remembering her first meeting with Jason was cheesy as hell (I like how they indicate the passage of time with bangs), but at least it was an effort to acknowledge someone important to her had died. Abe Leonard backed down! He also didn’t get killed, which I thought was something the bad guys were planning on. Kirkman’s kids showed up briefly tonight. Remember when they seemed to be important?